OK, so I got nothin' this morning. I"m going to skim the intertubes for a bit; maybe something will catch my eye. And now I have something interesting. British Science has surely been hit hard over the last two months, but they're not all dolts. Labouring in obscurity in a lab in England, British botanists have brought back a fern from the brink of extinction in what should be a remarkable story. It looks just like a very small parsley bush, but it is actually a very special little plant indeed. Clean air has to be constantly circulated in the lab to protect it from any bacteria. 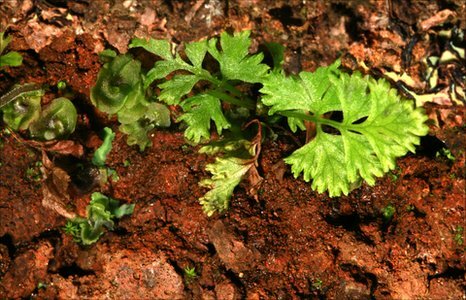 This precious specimen is the Anogramma ascensionis fern, commonly known as the parsley fern. Since the 1950s, botanists believed it to be extinct. It is native to Ascension - an island in the South Atlantic, which is one of Britain's overseas territories. And a small project supported by Kew's overseas territories programme has rediscovered and rescued it - a timely success story, as this year has been dubbed International Year of Biodiversity. Kew botanist Phil Lamden and local conservation officer Stedson Stroud found the plucky little plant clinging to a precarious existence on a mountainside in the harsh volcanic landscape. "We were down the back of Ascension's Green Mountain, which has very, very steep slopes. You have to be really careful because if you slip you're a goner," Mr Stroud recalled. "And we came across this beautiful little fern and immediately knew it was the lost Anogramma that had been extinct for the last 60 years."